On this day in history, January 14, 1784, the Treaty of Paris brings the American Revolution to a formal close. After the surrender of Lord Cornwallis' army at Yorktown, Virginia in October, 1781, the British Parliament began to lose its will to fight the war. In April of 1782, the House of Commons decided to bring the war to and end and peace negotiations began in Paris. 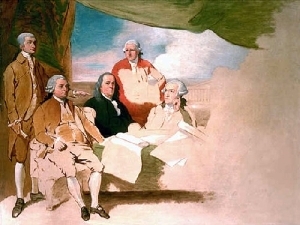 The Americans were represented by John Jay, John Adams and Benjamin Franklin, while Richard Oswald was the British negotiator. A preliminary peace treaty was signed on November 30, 1782, ratified by Parliament on January 20, 1783 and by Congress on April 15, 1783. Final terms still had to be reached however. Skirmishes between both sides still took place here and there and George Washington kept the Continental Army together at Newburgh, New York in case hostilities broke out again. 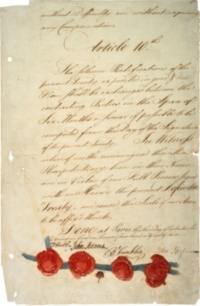 The final Treaty was signed between the negotiators on September 3, 1783. The signatures of Jay, Adams and Franklin appear on the last page of the document, as well as that of David Hartley, who had replaced Richard Oswald. The American Congress ratified the document on January 14, 1784 at the Maryland State House in Annapolis, Maryland, where Congress was temporarily meeting at the time. Great Britain ratified the document on April 9 and the two sides exchanged copies in Paris on May 12. 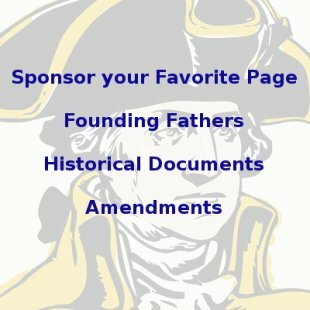 The Treaty of Paris has ten articles. The main points of the articles include: Great Britain acknowledges the sovereignty of the United States; the boundaries of the United States are set at (roughly) the Mississippi River in the west, the Great Lakes in the north, the northern border of Florida in the south and the Atlantic Ocean in the east; citizens of the United States may still fish off the coast of Newfoundland, even though it was British territory; legally contracted debts from before the war must be honored by both sides; Congress must "encourage" the states to protect the property of British Loyalists from confiscation and to return any property that was confiscated; all prisoners on both sides must be released; the British army must evacuate the United States and not take any American property, arms or slaves with them; both countries were given access to the Mississippi River; any territory conquered by either side after the treaty was signed had to be returned; and both countries must ratify the document within six months of the signing. The Treaty of Paris formally brought the Revolution to a close. Conflict continued, however, due to several factors, including the British failure to leave all its forts on the western frontier; the British continuing to encourage Native Americans against the United States; British confiscation of American ships in French waters and impressment of American sailors into the British navy due to a trade war between France and Britain. Some of these issues were ironed out in the Jay Treaty of 1794, negotiated by John Jay in London. 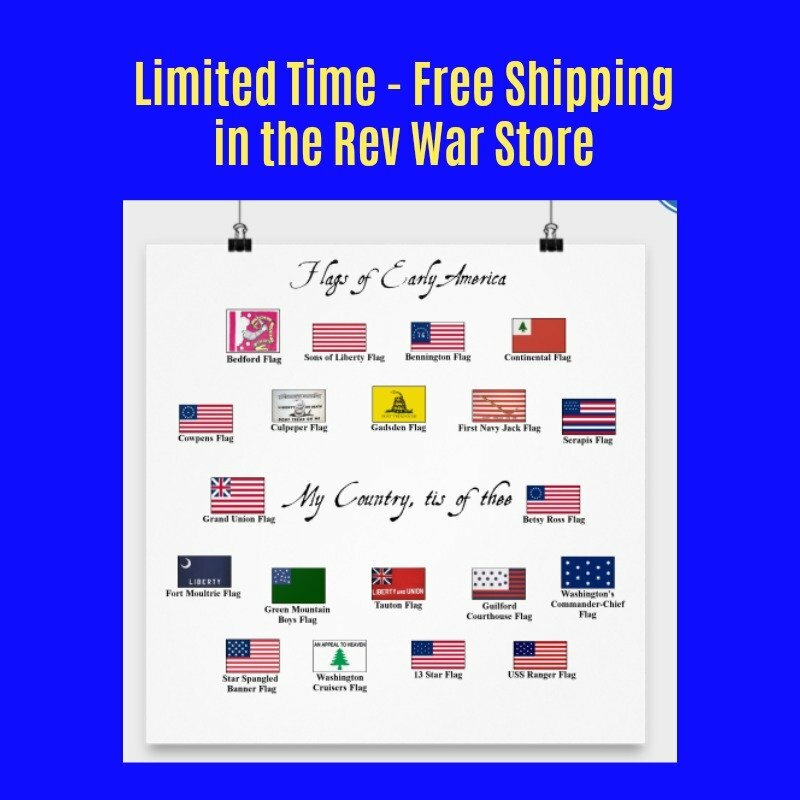 However, some issues remained and war broke out again between Great Britain and the United States in 1812.